It is easy to lose ourselves to the daily-ness of our own lives, between scrolling through Twitter feeds, flipping through newspapers, commuting to work or school and engaging in more flexible schedules than ever before. Schedules where work/life balance exist less and less, and our days blur together slowly as our lives sift past us. Caught in the maelstrom of everything coming at us, it is very apparently easy for us to lose ourselves, to lose who we truly are to the beating of the drums around us. An entire industry of self-help books has been devoted to finding who we are and what that means. There are even a number that have come out in the past year by Christian authors, indicative of the fact that Christians struggle with identity just as much as non-Christians. The Truest Thing about you opens with a gracious and kind letter of introduction from Francis Chan, providing some context for the first book from San Francisco pastor David Lomas. Through the course of the book, we learn that Lomas, pastor of a church that started out of the Castro District in San Francisco, originally hails from Bakersfield, California and has reflected significantly on identity and what our identity as Children of the King is. Lomas’ book starts off with small pieces, using each chapter as a building block. His paragraphs are short and mighty, well spaced on the page to give a reader a moment to allow the weight of his statements. Lomas pulls at the dissonance he seems to have felt at one time and that we have all felt, the confusing of who we are when we live lives that require us to be many things – brother, friend, student, teacher, employee, co-worker, customer, etcetera. Through personal experiences, ancedotal stories and common examples than probably even young children could understand, Lomas builds to the Truest Thing about us, and the importance of what we should be basing our identity around. Lomas pulls in relevant texts from the Bible, most memorably some references to Genesis and who God made us to be, Christ’s submission to be baptized by his cousin John, and the instructional teachings of Paul. The book seamlessly excavates these texts and makes them important and relevant to ones life. The Trust Thing About You: Idenity, Desire and Why it all Matters (ISBN: 978-0-7814-0855-4) by David Lomas is published by David C. Cook and available in paperback for $14.99 at a bookseller near you OR you could win a free copy in the giveaway. 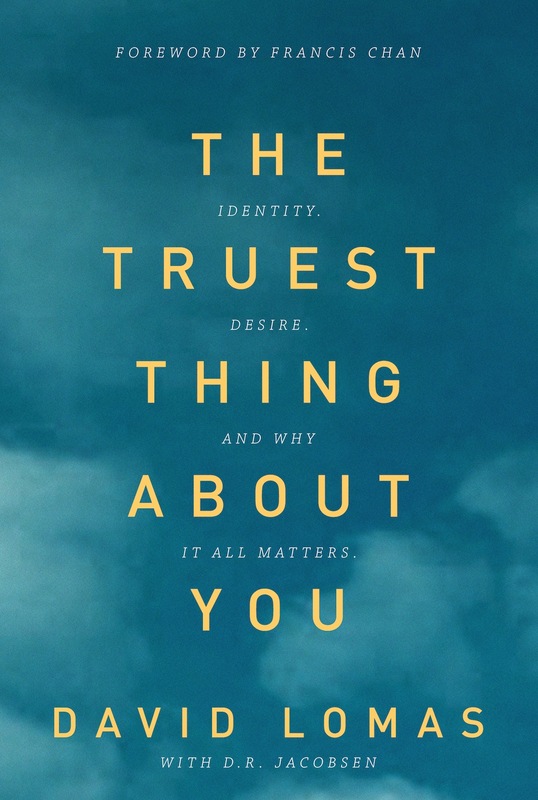 I have three copies of The Truest Thing About You by David Lomas that I will be giving away for free (cost of shipping, if necessary, included). Do all of the above and you could have three entries! I will put all the names of entrants in a hat and draw names in a live recorded video blog post that will be posted this weekend. Good luck! Excited to read this! Hope to win it! Our identity in Christ is a major issue that I speak to my students about regularly! A friend strongly recommended to me this book–speaks about the correct order of transformation: Gospel works should be grounded first in Gospel Identity. I would love to read this book. I believe the true Christian identity is something that gets too little coverage. I would LOVE to Win this!!! Super-Excited about Reading!!! PTL!!! This looks a like a great read and a reminder that all of us need to hear. Identity is something we struggle with. This sounds like a great book! A timely book. I was saying to a Christian sister the other day how with today’s technology it is so very easy to forget God and all the proper priorities. I heard nothing but great things about this book! and I have had the honor to minister with many for Reality SF. Would love the opportunity to read The Truest Thing About You, in hopes it could personally help me in finding my identity of who I am. Thank you for the possibility of getting a free copy. God Blesses those who bless others. love to review this book. Interesting! And a giveaway?! Even MORE interesting!! This entry was posted on February 12, 2014 by Nathanial in Book Reviews, Faith.